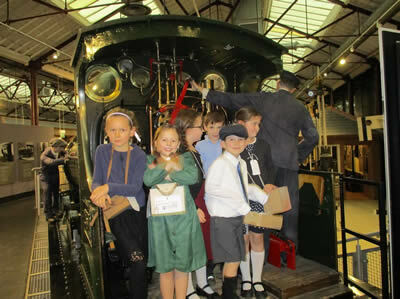 On the 25th January, the Year 3 children headed off to Swindon to visit the Steam Museum. The trip compliments their topic this term, which has been about World War 2. At the Steam Museum, the children learnt what life was like for children who were evacuated from their homes in cities, like London and Bristol, and sent to live in the relative safety of the countryside. The children were dressed in period clothing and carried gas mask boxes. They then experienced what it was like to board the train, ready to leave. The day featured a number of activities that helped bring history to life. They had a wonderful time and it has really helped to inspire their work back in class.